All across Ireland there are buildings about which little is now known, their histories somehow mislaid between the date they ceased to serve their purpose and the present. Sometimes snippets of a story evolves into a legend which, like a version of Chinese Whispers, bears little relation to the original truth. But on other occasions, the history disappears altogether, as though presaging the fate of the building itself. Kilcrea, County Cork has been mentioned here before, both in relation to the former Franciscan friary (Lo Arthur Leary, November 2nd 2015) and the nearby former McCarthy tower house (With Panoramic Views, June 11th 2016), both of which date from the 1460s and have reasonably well-chronicled histories. However there is a third building in the same area about which little appears to be known, even though it is of more recent construction. This is Kilcrea House, a view of which is shown above (the tower house can be seen in the background on the extreme right of the photograph). A little information about Kildrea House can be gleaned from that always helpful website www.landedestates.ie. In 1750 Charles Smith’s The ancient and present state of the county and city of Cork reported that Kilcrea, formerly the seat of the Earls of Clancarty, had been purchased by Captain Hedges from the Trustees of the Hollow Blade Company. In 1786 William Wilson’s The Post-Chaise Companion noted the ruins of the friary and castle, near to which was a house called Snugborough, the residence of a Mr. Keeffe. 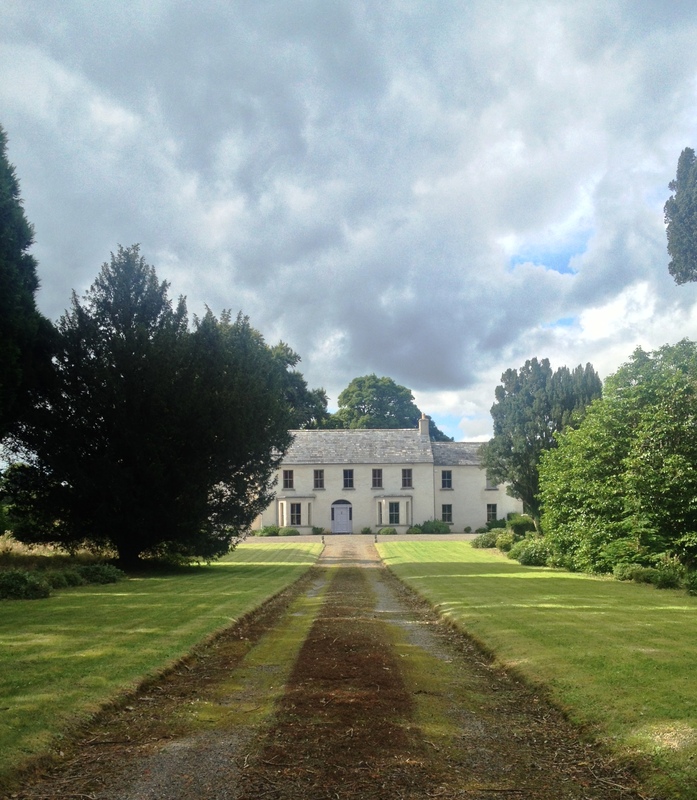 By the time of Griffith’s Valuation in the 1850s Robert Gibbons was given as the occupier of Kilcrea House. He held the building (valued at £20) as part of a parcel of land leased by John Hawkes. Yet strangely in March 1851, and again in July 1853, the estate of William Edward Ellis at Kilcrea, including the house and 422 acres, was advertised for sale. It would seem the Hawkes family acquired this, and further land, since by the 1870s the estate of John Devonsher Hawkes of Kilcrea is given as amounting to 2,029 acres. Of course this information, while helpful, tells us nothing about Kilcrea House itself, when it was built and by whom. The place is now a shell, but this decline would appear to have occurred only relatively recently. While the floors have given way and most plaster come off walls, there are still traces of the wooden window frames and joists. Of two storeys over basement, the house looks north towards the tower house and the breakfront on this side has tumbled down. Constructed of rubble and brick, it has arched ground floor windows of cut limestone, also seen in the single-storey bows on the east and west sides of the building: it would appear these bows were added at a later date. The east side has a short flight of stone steps which gave access to the house while the south and west fronts retain traces of the slates with which they were once covered. Stylistically the house would seem to date from the late 18th century (with subsequent additions) but it is now so far deteriorated that conjecture must be to the fore. It seems strange that despite its size and prominent location there appears to be little knowledge of Kilcrea. Another example of lost history. Below is a view of the house from the nearby tower house. Like most country houses, Shankill Castle, County Kilkenny has a range of outbuildings close to the main residence. The latter dates from c.1825, its neo-gothic design attributed to local architect William Robertson. The other structures, composed of cut limestone with granite for windows and doorcases, share stylistic similarities and can therefore be presumed by Robertson also. Some of them are used as studios and gallery space by the property’s present owners, but what to do with the others? Expensive to maintain, they no longer appear to have an apparent purpose. This is the conundrum facing everyone today responsible for such buildings. Seen from the shore of Lough Derravaragh: Coolure, County Westmeath. The house dates from c.1785 following the marriage of Captain (later Admiral) Thomas Pakenham to Louisa Staples. The couple immediately embarked on building their new home and when Lady Louisa Conolly, who had brought up the motherless Louisa Staples (her husband’s niece) at Castletown, County Kildare came to visit, she wrote, ‘The Coolure House is in vast forwardness, and a sweet pretty thing it will be. Tom Pakenham and Louisa seem equally engaged about it, though in different lines. He minds the farm only, and leaves the house, plantation and gardening entirely to her. But both agree in loving the place and wishing to spend their lives there.’ As indeed they duly did, further extending the house in the early 1820s presumably to accommodate their substantial family (Louisa Pakenham had fifteen children). The building’s finest external feature is the tripartite cut limestone Doric doorcase, with sidelights and spoked fanlight beneath a pediment. This week the Irish Aesthete marks its fourth anniversary. It is remarkable that an initiative started almost on a whim has continued for such a long period, and looks set to carry on doing so. The need to find ‘fresh’ (albeit old) material for this thrice-weekly site has encouraged me to take greater interest in, and investigation of, this country’s architectural heritage, providing opportunities to return to old favourites as well as abundant chances to explore other sites hitherto overlooked, at least by myself. There continues to be no shortage of places to visit, photograph (with mixed results) and write about. Sometimes the outcome is a feeling of despondency, but just as often one comes away elated, thrilled to learn there are people across Ireland who care passionately for the preservation of our country’s tangible history and are actively ensuring it has a viable, vibrant future. Such is the case with the house shown today. Rush Hill, County Roscommon featured not long after the Irish Aesthete began (see The Folks Who Live at Rush Hill, November 12th 2012) and after an absence of almost four years was recently revisited. Listed as one of the four ‘gentlemen’s seats’ in the area in Samuel Lewis’s 1837 Topographical Dictionary of Ireland it is the only one remaining. The core of the house dates from c.1700 and until almost the end of the 19th century it was the residence for successive generations of the same family of tenant farmers. A fire which broke out not long after it was taken on by another family resulted in a programme of rebuilding and augmentation, as can be seen by the ground floor bay windows. But much of the building would look familiar to earlier occupants, especially after the under the care of its present owners. Rush Hill’s renewal has been a gradual process, one by no means complete. It was fascinating to see how much more had been accomplished over the past four years, and to hear of intended work during the years to come. Thanks to such care the house looks as though it will continue to serve as a ‘gentleman’s seat’ long into the future. The Irish Aesthete rather too often focusses on ruins, so it is a delight to feature a building which, prior to being taken on by the present owners, seemed destined to go the way of so many others in this country. One looks forward to reporting more such stories; please feel free to get in touch if you know of any. This site is always looking for further material, and welcomes your thoughts, comments and – provided politely phrased – criticisms and corrections. There are many plans for the year ahead, including expansion into other areas and media. In the meantime, please continue to follow the Irish Aesthete not just here but also on Facebook (TheIrishAesthete) Twitter (@IrishAesthete) and Instagram (the.irish.aesthete). And thank you as always to friends and followers for your kind words and encouragement, these are very much appreciated. The now-roofless church in Kilnaboy, County Clare is similar to many others in the region, dating from the 11th century with subsequent additions such as the late-mediaeval east window (seen above). One unexpected feature of the building can be found over a door on the south side: a Sheela na gig. For those unfamiliar with these figures, of which around 100-odd exist in Ireland, they are believed to be fertility symbols which first appeared in this country during the 12th century, perhaps introduced by Anglo-Norman settlers. During an interview given in March last year, Dame Helen Ghosh, director general of Britain’s National Trust caused widespread umbrage by announcing the organisation intended to simplify displays of artwork in its properties. Visitors, she declared, were put off because there is ‘so much stuff’ in some of the historic houses owned by the NT. ‘We just make people work fantastically hard,’ said Dame Helen, ‘and we can make them work much less hard.’ Understandably this approach, implying the trust’s members were incapable of appreciating works of art or of understanding the context in which they are shown, met with disapproval in many quarters. Dame Helen’s comments suggested the trust’s intention was not to encourage instruction (because that might require people to ‘work fantastically hard’) but to accept incomprehension. It indicated entertainment would be given precedence over education, without understanding that some visitors, possibly the majority, actually want to learn more, want to come away from a visit with greater knowledge and understanding. Of course it is true the majority of visitors to historic properties are unlikely to have first-hand experience of living in such an environment. Nor will their forbears have done so. Hence the evolution of country house displays, which initially concentrated on showing only the main reception rooms, those spaces in which the best furniture and paintings were on view. More recently, and in part thanks to television series like Downton Abbey, the opportunity to explore what took place on the other side of the green baize door has become increasingly popular. Life at the top and the bottom of a house, the rooms used and occupied by servants, can be less immediately aesthetically pleasing but they hold other attractions, not least an opportunity to discover how a building operated. In its heyday, the country house was like a complex machine in which all the parts worked together to ensure smooth delivery of service to the owners. Only by looking at the rooms in which this work took place can one fully understand how a great house functioned successfully. This explains why they merit investigation. However, there is another reason why these areas can sometimes be worth exploring. Kilfane, County Kilkenny has been discussed here before (see When Nature Imitates Art, November 11th 2013), specifically in relation to a picturesque garden developed on the estate in the 1790s. The land here had originally belonged to the Cantwells, prior to the family being banished to Connaught in the 17th century. It then passed into the ownership of Colonel John Bushe who was granted Kilfane in 1670, and his descendants remained on the estate for most of the following century. In the late 1700s, John Power married Harriet Bushe whose brother Henry Amias Bushe then lived at Kilfane. Power was the son of a County Tipperary landowner who had served with the British army in India where he had been aide-de-camp to Clive during the Battle of Plassey. Eventually he took a lease in perpetuity on Kilfane from his brother-in-law, and carried out many improvements on the estate. It would appear at least one explanation for his settling in County Kilkenny was a keen interest in hunting: in 1797 he established the Kilkenny Hunt Club. The first of its kind in Ireland, the club would meet in the evenings in Kilkenny City at what had hitherto been called Rice’s Hotel (James Rice having been house steward to Captain Power) but soon became known as the Club House, as it is to this day. An existing house at Kilfane seems to have been remodeled by the Powers around 1798. A couple of years later, William Tighe wrote ‘To Kilfane, Mr Power has added a new front and other improvements, which render it not only an excellent house, but a good specimen of architecture.’ As then completed, the main block was of five bays and three storeys over basement with a single bay, one storey projecting porch on the ground floor, and three-bay single storey flanking wings. The building was comprehensively enlarged around 1855-6 by local builder/architects Patrick O’Toole and Joseph Wright who added three-bay two storey recessed blocks behind the wings and gave the porch bays on either side. Kilfane may have undergone further alterations in the late 19th/early 20th centuries but little else appears to have been done to the building prior to 1971 when Kilfane was sold by the Powers. It has recently come on the market again, providing the opportunity for a recent visit to the house. Trying to understand the architectural development of Kilfane is challenging because, as is so often the case, little information survives. We do not know who, if anyone, was the Powers’ architect at the end of the 18th century, nor the appearance or layout of the house to which, according to William Tighe, was added ‘a new front and other improvements.’ Internally few clues are immediately offered. The entrance hall is wide and low, with screens of columns featuring composite capitals. Access from here is gained to the drawing and dining rooms, both with considerably higher ceilings (they each occupy a one-storey wing) and ample, full-length windows: the same characteristics are found in the former library behind the drawing room. These three spaces clearly date from the end of the 18th century, whereas the entrance hall could be earlier (and given its shape might originally have been a number of rooms subsequently knocked into one). Thereafter things grow more confusing, not least in the staircase hall which is wood panelled in a style that looks distinctly Edwardian. The first floor doorcases into the main bedrooms add to the muddle, being heavily carved in a manner suggesting German or Austrian origins. The mid-19th century alterations made to the building provide a fresh challenge, with flights of stairs on either side of the central block rising to more bedrooms. Greater clarity, and a better understanding of the house’s original form, may be discovered in the top and bottom floors, those spaces formerly devoted to servants. Because less subject to the whims of changing taste, these areas are more inclined to retain their earliest decoration and such looks to be the case at Kilfane. Here the second floor features a series of rooms, now in poor structural condition, with the same deep window embrasures, shutters and skirting installed at the end of the 18th century. The whole storey is centred around a landing lit by a funnel-shaped cupola: according to legend, the devil was once caught playing (and cheating at) cards in the house and fled through here into the night. The basement is equally informative as again the basic layout appears to have remained relatively unaltered. Hence the sequence of rooms is much as it would have been when the Powers first embarked on developing the property, the old kitchen still in place, together with the wine cellar, storage spaces, pantries and so forth. A large section of the basement occupies only the area taken up by the main block of the house, excluding the wings, suggesting this was what first stood on the site prior to the Powers’ intervention. A further examination of the house is merited to see what else might be learned here about its evolution. In this instance, the absence of ‘stuff’ on the top and bottom floors offers an opportunity for elucidation. This may not be what Dame Helen Ghosh had in mind when she gave her interview, but sometimes the most useful information about a house can be discovered beyond the green baize door. Pay no attention to decorators, designers, or passing fashions: from one season to the next nothing better becomes a house than a well-stocked bookcase (although a well-stocked cellar is also appreciated). Here are two of them within the library at Ballinderry Park, County Galway, an 18th century house that has been discussed before (see Sturdy as an Oak, January 6th 2014) but deserves regular revisiting, if only to linger over some of the many volumes gathered therein.